It’s replacing or resurfacing of the worn out smooth lining (cartilage) with metal lining hence restoring the functionality of the joint. Surgery takes around an hour for single knee replacement. Bilateral knee replacements are done simultaneously if needed. Patients are kept in ICU overnight if warranted. Preparation of the bone: The damaged cartilage surfaces at the ends of the femur and tibia are removed along with a small amount of underlying bone to make it even. Positioning implants: The removed cartilage and bone is replaced with metal components that recreate the surface of the joint. These implants are cemented or “press-fit” onto the bone. 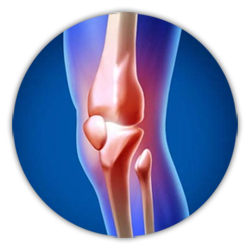 Resurface the patella: The under surface of the patella (knee cap) is resurfaced with a plastic button. Most of the times resurfacing the patella is not required. Insert a spacer: A medical grade plastic spacer is inserted between the metal components to create a smooth gliding surface.